Here's an interesting juxtaposition - an early member of UFOIC forwarded this 1965 clipping of a UFOIC meeting in Sydney with Dr. Miran Lindtner lecturing. The "saucerers", particularly from a British and social history perspective, are revisited in a new book by Dr. David Clarke and Andy Roberts "Flying Saucerers: A Social History of UFOs" from Alternative Albion press (2007), which can be acquired via Amazon UK. I look forward to a detailed reading of this title. 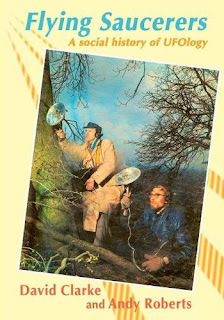 "The Flying Saucerers" was used as a title in one of Arthur Shuttlewood's Warminster books in 1976. 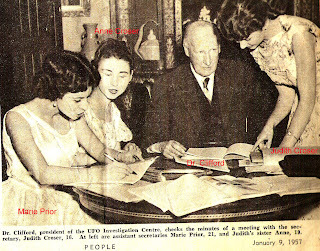 The young lady in the photo taken in January 1956 is 16 year old Judith Croser who came up with the name UFO Investigation Centre. Three months later on 4th April she and her sister Anne joined the Australian Flying Saucer Research Society (AFSRS) NSW Branch. She became the group secretary on 4th June. After the 14th November 1956 meeting which decided on the split from the AFSRS Judith came up with the UFOIC name. "They were truly a wonderful group of people and treated me with a lot of respect, considering how young I was." The various manifestations of UFO work that have occurred under the name of UFOIC - the UFO Investigation Centre - based in Sydney from 1956 to now are summarised in this web log in the posting "The evolution of UFOIC"(January 4 2007). It was formed from the remanents of Edgar Jarrold's pioneering group the Australian Flying Saucer Bureau (1952-1955) and the transition stage as a New South Wales branch of the South Australian group the Australian Flying Saucer Research Society (AFSRS NSW branch: 1955-1956). In a committee meeting at Dr. Clifford's home in Warrawee/Turramurra, a northern suburb of Sydney on Wednesday 14th November 1956 a significant decision was made. The young secretary Judith Croser recorded, "We are breaking off with Mr. Stone and are going to carry on independently." Fred Stone was the national director of AFSRS in South Australia. Late in 1955 he had travelled to Sydney to discuss the future of Sydney based UFO work with the remaining close associates of Edgar Jarrold. Jarrold had left the UFO scene and because his organisation had a strong individual nature that focused around him, his departure left a fragmented and shattered group. Andrew Tomas, Jarrold's closest associate undertook to reorganise the remanents into the AFSRS NSW branch. Tomas acted as president. Stone was in Sydney for a branch meeting on 3rd February 1956. Some 65 to 70 people were present. Stone returned again for a members meeting on 4th June 1956 and gave a lecture. Judith Croser volunteered to be secretary for the group. She recorded that there were 27 paying members of AFSRS in Sydney. Soon after this meeting Andrew Tomas went on a short overseas trip. Dr. Clifford became the new AFSRS NSW branch president. Members of the Sydney group began to become concerned with the strong religious bias in Fred Stone's perspective on the UFO/flying saucer mystery. Even Stone would acknowledge years later that this was the key factor in the sudden decision for the Sydney group to go its own way. Of course the great distance between Sydney, NSW, and Adelaide, South Australia, would have also been a major issue. By the time of the 14th November 1956 meeting Andrew Tomas was quite adamant about initiating an independent group. A rather heated general member's meeting followed on 21st November 1956. A few suggestions were put on the table, and "UFO Investigation Centre" won the day ... It sounded right. It flowed well. Everybody agreed unanimously. "A 16-year-old girl was recently appointed UFO Investigation Centre secretary. 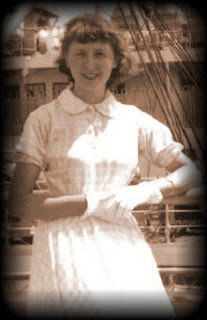 She is pretty and earnest Judith Croser, of Balgowlah, Sydney, and she became interested in UFOs four years ago, when she was attending Cremorne High School and a saucer appeared in daylight. "Judith says the saucer was in sight for about 10 minutes. "All the girls saw it. Our geography teacher couldn't tell us what it was. It shone with a brilliant, white light." "Her theory is that the saucers' increasing appearances during the past 10 years mean they are approaching the earth to make observations before attempting landings. Like Miran Lindtner, Judith thinks the sightings are coming to a climax and that the landings will follow soon. The space people will come as friends, she believes - and hopes." A very helpful early member of UFOIC has assisted me in gaining a better understanding of some of the highlights of the group's past. One episode was the controversial visit to Australia in 1959 of notorious American contactee George Adamski. The member provided me with a revealing diary entry which records that Dr. Greenwell resigned from the UFOIC presidency on the same day as the George Adamski public meeting at Adyar Hall Sydney on Friday 27 February 1959, apparently "because of all (the) trouble". It also indicated that there was much trouble with the arrival of June Marsden who "hosted" George Adamski's visit to Sydney. The diary records that Adamski and Marsden "were fighting like mad". What was that all about? The following information explains what happened. The diary entry led me to re-examine the UFOIC UFO Bulletins and other sources to clarify this provocative entry. This confirmed I was incorrect on my understanding that Miran Lindtner became UFOIC president in December 1958. Dr. Greenwell's resignation was announced in the April 1959 issue "for personal reasons." Miran Lindtner became president in late February 1959. June Marsden was "profiled" in the Jan 1959 issue of the UFOIC UFO Bulletin. Unstated in the piece was that June Marsden held the position that astrology had a signicant connection with UFOs. June was by 1959 a noted socialite, her real name Mrs. Erica Ingram-Moore, and she was also a prolific writer, particularly in the field of astrology. Her book "Follow Your Stars to success" was published in the US in 1956. It was originally published in Sydney in November 1936. June Marsden was featured in a Daily Mirror article Feb 19 1959 which described her odd ideas about astrology and flying saucers. I also have a letter dated Nov 13 1957 from Adamski to June Marsden which was pretty cordial. She had visited Adamski in California and this no doubt led to her being his hostess when he came to Sydney. Stan Seers gives an unflattering picture of the Sydney Adamski tour in his book "UFOs - the case for scientific Myopia" (1983). Stan was the Queensland Flying Saucer Bureau president at the time of the Adamski visit and he was in Sydney during the period. He makes some unflattering comments about "a well known Sydney socialite". Adamski himself in his book "Flying Saucers Farewell" (aka "Behind the FS mystery") refers to his hostess "an astrologer. She was endeavouring to associate astrology with the space people and their craft. I explained to her that no connection existed between the two, but she refused to accept the logical facts. Like many people, she had closed her mind to any ideas which differed from her preconceived notions." Adamski's book also describes problems in Sydney such as no "work permit" or the lack of UFOIC sponsoring, and an alleged run-in with "the censor's office" about the "saucer" films he was showing. I gather UFOIC was touchy about the issue of sponsoring Adamski, wanting to distance themselves. It seems that these issues came to a head at the Adyar Hall and Metropole meetings of 27 Feb 1959. It seems clear that UFOIC was struggling to ensure it was seen as a credible organisation. Adamski's visit to Sydney in 1959, and the lightning rod it provided for all manner of bizarre takes on the flying saucer controversy, was putting all those efforts at risk. Dr. Greenwell's resignation from the UFOIC presidency was one apparent result. However Dr. Miran Lindtner took up the UFOIC presidency and his long energetic leadership facilitated a strong UFOIC group. Photo: (Bill Chalker) Some of the coverage of Adamski's 1959 visit to Australia.